Last night was the first time I attempted a long exposure capture of the bay. Although the sky was clear, the water moved beautifully. Stacking both a .6 and .3 ND filters, thanks to Mabry Campbell who has mastered the art of Long Exposure captures, here is my best capture of the evening. With a five minute exposure, the water started to become silky. Clearly to make this scene spectacular, cloud movement will be needed. No worries though, as the Maine heat wave is to end tonight and rain is rolling in. Adding to drama in the sky, and hopefully some fog filled moments. Inspired by the sun, I decided to set the alarm for 4:00 a.m. for a 5:00 a.m. sunrise. 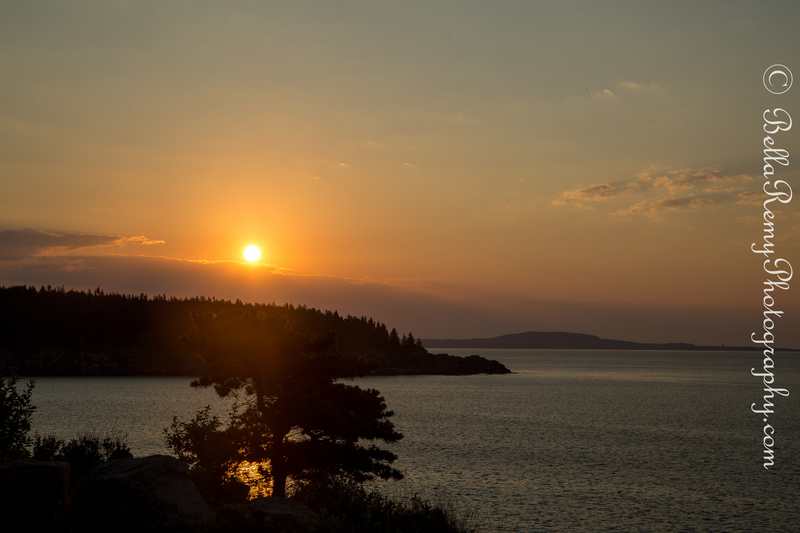 Even though this is the fourth year spending some holiday time in Acadia, I’ve never gone to Cadillac mountain for sunrise. This morning, I decided to follow the tourists and bikers up the mountain. My first captures that I took there didn’t pass my cut, and the cloud cover wasn’t complimentary. So I left ten minutes early. I shouldn’t have..as the sun came out brilliantly. At least I was able to enjoy it while driving along the Park loop. 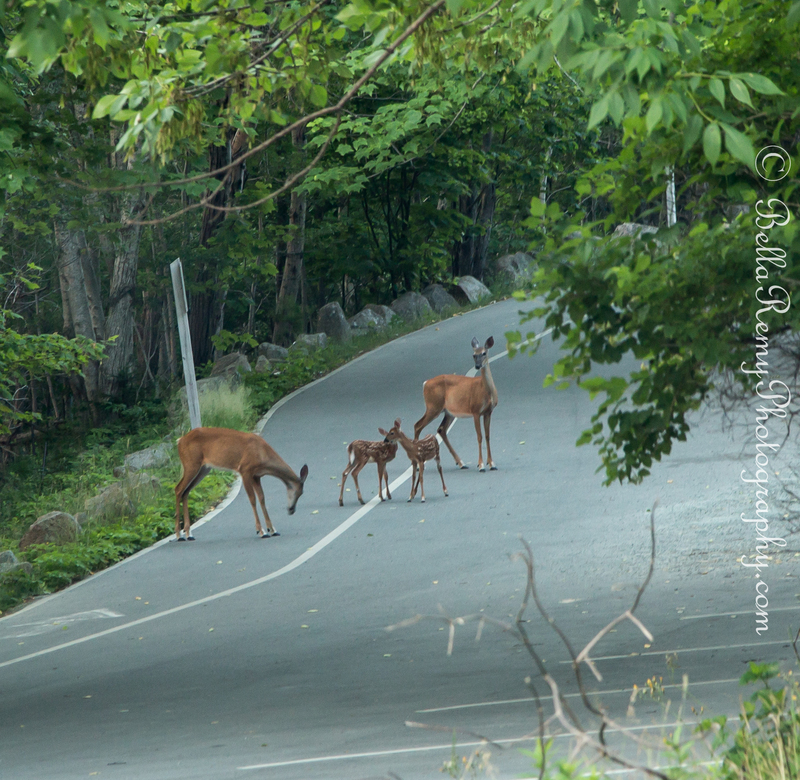 But getting a head start from the tourists hitting the over popular Park Loop road, I was able to capture these two does and their fawns with spots. Although it was one of those times that I was unprepared. Packing light in the morning, I only brought my walkabout 24-105mm lens and left the 500mm and 100-400mm lenses at home. This was the best I could do with the equipment I had. The scenes along the road were stunning, with the morning sun warming the pink granite rocks. Lobstermen were out early tending to their traps, and the sea was quiet at Thunder Hole. Another wish thing on my list this visit was to walk the full 3.3 mile circuit around Jordan Pond. The view over “The Bubbles” continued to get better and better the closer I got towards them. I also discovered the birds ! Again…under equipped. But at least I know now where to return to. One of the best moments of this mornings walkabout was when I was just wrapping up on the trail. 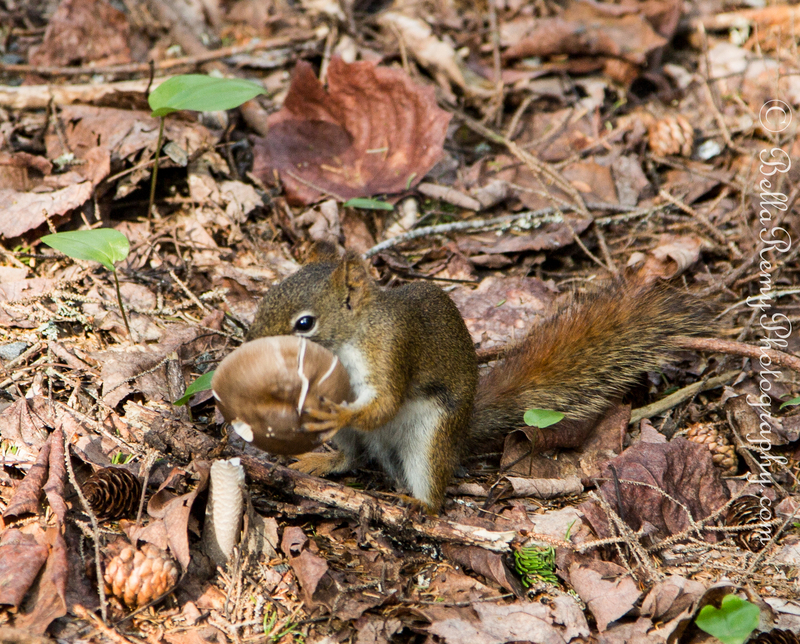 This adorable Red Squirrel ran across the trail and was quickly a mushroom thief. I’ve never seen a squirrel eat a mushroom, and this was a big mushroom. Bigger than his head! Hopefully it wasn’t one of Alice’s mushrooms. You truly are..in spirit and mind. Thank you so much ! It was a great day. What a great set of photos…. Tremendous images of this wonderful area Emily! Have you ever been here Phil? It’s glorious ! So far my bird count is 55 for the week. Not bad, although most was by sound. 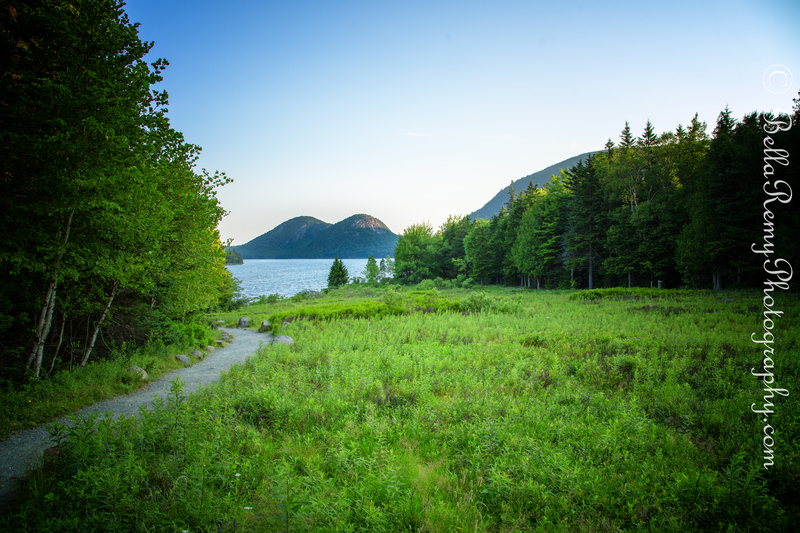 Maine, the way life aught to be – fantastic photography of my favorite place on earth. Beautiful quality. 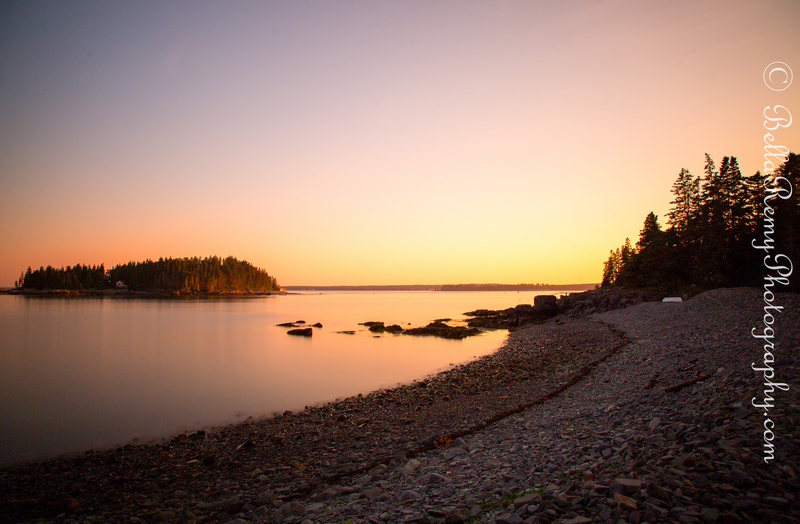 If we could all live in coastal Maine. Life is so much more relaxed. Love how you shared how this photo made you feel. The weird thing about this long exposure is that the image was SO filled with bad noise. Seems even with ISO 100 the pixels get expanded. I need to ask Mabry what the deal is on that. Spectacular images all!!! I especially love those long exposure shots! I really do too, how they make things so glossy. I need to practice more, but keep getting distracted by birds. You should hear the sound of these squirrels, I thought it was a bird at first, but nope. It’s a crazy sound. Great job on that 5 minute exposure! Thank you so much Michael. You do long exposures too right? What times do you on your images? I don’t do a lot of them but usually the time will vary for the given scene and the light available. The recent shot on my blog of the Liberty Belle boat reflection at Disney was a 21 second exposure. I have a project I am working on for a night time shot in HDR and the total combined time of all the brackets to be shot runs about 10 minutes. Wow, so cute!!! Fabulous squirrel shots!!! Thanks Rexlin. That mushroom squirrel really was too much. He just snapped that right off of the stem and ran off with it. I love the long exposure! I’ve been considering picking up a set of neutral density filters, as soon as I can decide which of the lenses I have to use for a shot like that. The deer are darling, and the squirrel is very cute, as most squirrels are. I can’t believe that you don’t bring one of your long lenses with you to keep in your vehicle on even a short trip like that. Ok..I was a dummy..I was trying to keep focused on just one subject matter. But I was like a dog with AD&D – BIRDS!! For the ND filters, just your regular walkabout lens would be just fine. Although you have to be committed to want to use these. A Grad ND is probably better for you so you can drop down the sky on those high contrasts conditions. I’ll probably buy a set to fit the 15-85 mm lens, as I would be most likely to use them on that lens. Then, see if I can get a step up ring to adapt them to the L series lens. I have a set of ND filters from back in the days of film, but they are too small for any of my current lenses, and really old, so they probably can’t match today’s quality. Ok, so here is my kit. 16-35mm, 25-105mm, 100-400mm. The best part?? They all fit 77mm filters! I find that I use them rarely as you can now apply filters post processing with RAW images. Did you plan that, as far as the lenses all taking the same size filters? Actually, I’m not that smart, just happened to be. I bet Canon thought it through though. Oh what a beautiful area! Thank you for sharing it. That red squirrel is a hoot. Great shots! Thank you so much, this island is truly magical. Such a wonderful place and you would love the gardens here. Cottage summer gardens galore. The deer and fawns were really too adorable. Thanks! So glad you are enjoying your time up the road from me. Hot summer days a little cooler at night. I hope the heat broke for you today like it did for us here. It’s been crazy hot! Fantastic photos. The first sunset photo is extraordinary. I always love wildlife photos and that chipmunk is just way too cute. Thank you so much my dear. It was a wonderful photography day. That chipmunk was too darling and ran right between my legs. Couldn’t believe it and will always remember that special moment. 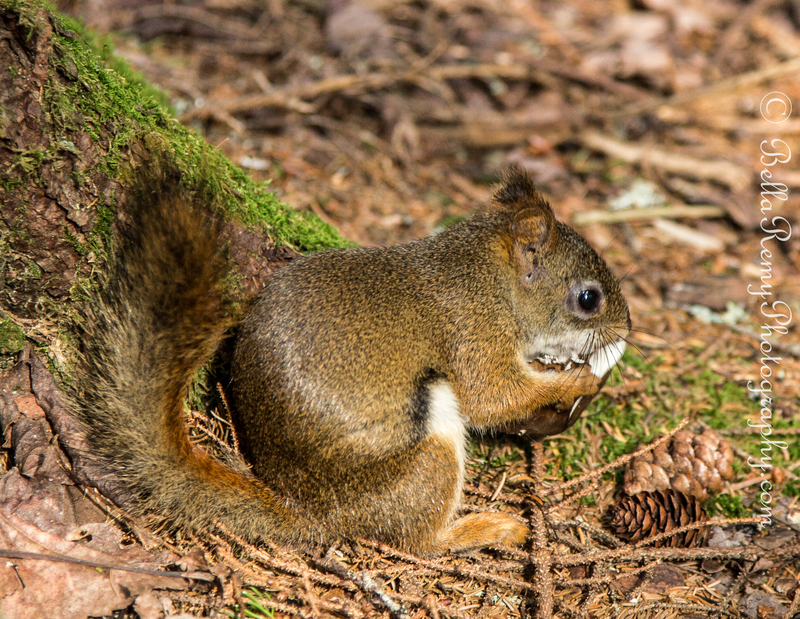 Oh wait..the chipmunk isn’t in this post – this is the red squirrel that ran across the trail and went “Mushroom!” saw me..then quickly turned around and snapped it right off of the stem and ran off to the tree to eat it. It was awesome and funny. Those are really great photos Emily! i love the mushroom eating squirrel. I have never seen that before either. Thanks Mark. You would have love it. He beelined to that mushroom saw me. Passed it then stopped. Looked at me to see if I was a threat then turned around and snapped the top right off of the stalk. Then ran off to eat it. It was awesomely cute.